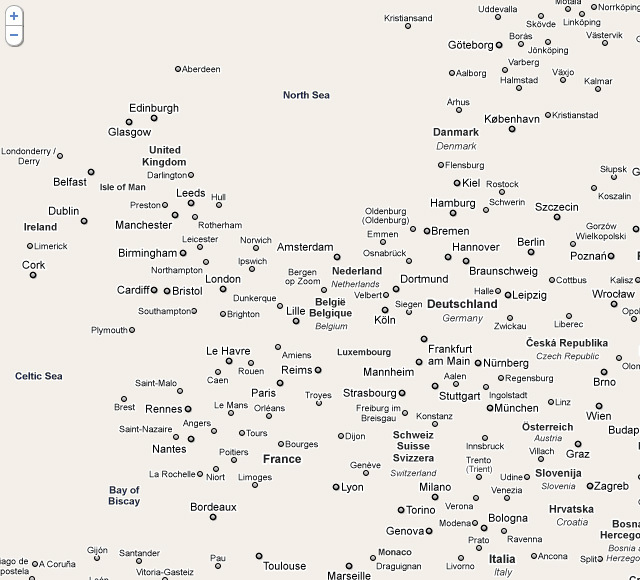 Damon Zucconi has stripped Google Maps of its usual basemap data, leaving only the labels. An artist, Zucconi named the piece “Fata Morgana”. A fata morgana is a mirage that appears in a narrow band right above the horizon. Zoom out, and the only viewable text are labels for the continents and oceans. Zoom in to see Google’s scale dependent rendering change as labeled major cities and states make way for roadway markers and arterials. The map itself obviously has no navigational value but it was interesting to explore the world through annotation alone. In some instances, the cluttering of annotation is so dense, you can visualize the shape of the continent.